I have a distinct memory of seeing my good buddy and guide Kevin Morlock pulling on his waders. Patched with tape, glue and other home brew leak prevention remedies. I asked Kevin why he didn’t get high end waders with a warranty and he said his wader would always be in the shop getting repaired if he did. Your waders won’t last a lifetime. So when they start leaking beyond repair, consider cutting the neoprene boot off to use with your wading boots wet wading. Wet wading on a hot day is a great way to stay comfortable. For some areas, like in the Smoky Mountains felt bottom waders are essential to gripping onto the rocks and shale. Whatever grows on those submerged rocks is like wheel bearing grease. In my video on staying warm winter fly fishing I talk about this as well. It was a game changer to start using Hot Hand Brand Toe warmers. I use them on most every trout fishing trip. Having warm toes while wading extends how long I can fish, which directly reflects on how many fish are hooked. One of my favorite canoe fishing rivers has a long bend with lots of logs and debris on the outside of the bend. The best way to fish this stretch is with streamers tossed right into the wood. Which means lots of lost flies, but also lots of fish. So, I’ve got to carry replacement flies, but I still like carrying a minimum of stuff so I will clip my tippet onto my waders trap and DROP MY FLY BOX INTO MY WADERS. If your belt is snug (which it should be) the fly box will super accessible. After a trip, brush off your waders and THOROUGHLY DRY them. I love storing mine in a 25-gallon tote with a removable lid. I loosely roll the waders up from the sock to the chest and drop in the bin with my boots. The lid works perfect for using as a changing mat. Standing on a gravel road in your stocking foot waders is a sure way to get a leak. Plus the tote caries all my other wading accessories like my wading staff, wading belt, YAKTRAXs and toe warmers. The surest way to ruin your wader suspender straps is to hang your waders from them. 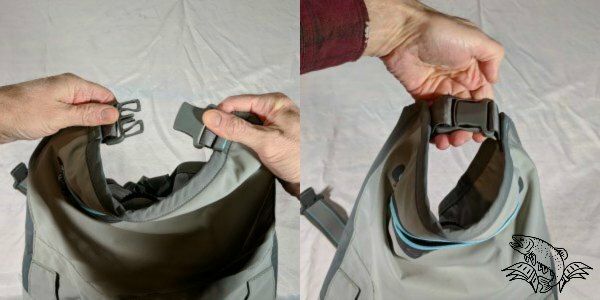 Get some wader hangers that grab onto the boot heels or try this hack. Most waders have alternate buckles on the front. Unclip the flexible shoulder suspenders and snap the FRONT BUCKLES together. These front buckles don’t have elastic, so they won’t stretch out. Before I purchased my REDINGTON FLY FISHING Fleece pants that have stirrups for holding them down. I got into the habit of tucking my pants into my socks. The trick to doing this right is to pull the loose pant material towards the back and neatly folding the material to the outside of your leg. Doing this will insure you don’t have a big knot of material on the inside of your leg that rubs on your other ankle. About the time you’ve got all your gear on, it seems like it’s time to pee. The idea of removing your vest, net, jacket, and gloves is just a pain. Years ago, Guide Dustan Harley taught me this trick. Most wader suspenders have opposing buckles on the front. Instead of unbuckling and let the suspenders hang, snap them together in front of you. As you pull your waders down the suspenders will ride up to your neck and not slip behind you. Because the suspender ends are easily accessible you can keep all your gear on. When your done peeing, just pull up your waders and grab the suspenders up by your neck and clip everything together. Breathable waders have a couple technologies working together. Gore-Tex (Link to Wikipedia) material and a surface treatment called DWR. DWR or Durable Water Repellent is a coating applied to the outside surface of waders to prevent the outside layer from absorbing water. When water is a applied to new waders it beads-up and rolls off. As DWR gets dirty or is exposed to sun for extended periods it degrades. If you see water absorbing into the wader surface, this doesn’t mean it’s leaking. What it does mean is that the breathable characteristics of the waders is plugged. Usually after I’ve re-applied DWR to my waders or wading jacket I’m amazed at how well the water will bead-up and roll-off. One of my most popular articles details putting screws into the bottom of your wading boots. A great TEMPORARY solution is to use YAKTRAX. These stainless-steel springs bite through algae and improve traction on rocks. The best part is if your best friend has a beautiful wood drift boat you can easily remove the cleats so the boat deck doesn’t get torn-up. Get one-two sizes larger than normal to accommodate the larger wading boots used with socking foot waders. Oh… Get the PRO Version of the Yaktrax (link to Amazon) The strap over the top of the boot helps hold the tread in place for aggressive wading. I don’t recommend you do this all the time. But in a pinch if you don’t have a good way to carry your landing net you can stick it handle down behind you in your wading belt. This will put extra wear on your waders and many cause premature leaks, so don’t it this a habit. June in Michigan can mean 45 degrees in the morning and 80 degrees at lunch. How does a person dress for that? Wearing chest waders can get hot quick. A simple tip with chest waders is to roll them down. Conveniently, because the suspenders have alternating clips, it’s really easy to use the suspenders as a secondary waist belt. First fold the waders down to your waist. Next roll the top of the waders down to your waist. From here its easy to grab the suspenders and clip them together by wrapping them around you to your front belt area. I’ve written about this in another article, but it’s worth mentioning again. 12 to 15 screws in the bottom of your felt waders significantly improves traction. Lots of wader brands sell “WADER BOOT SCREWS”, but it’s a lot cheaper to get GOAT HEAD SPIKES. I bought mine at Amazon – here’s a link GOAT HEAD SPIKES. The shape of the screw head has four “prongs” that will grip onto those greasy rocks found in a river.